Can you seek compensation when injured in an accident caused by poor road conditions? Car accidents can result from a combination of factors: the driver, the vehicle, and the roadway. Often, more than one of these factors are involved in a collision. For instance, maybe a driver was illegally texting and driving when they hit a pothole and careened into the other lane, hitting another vehicle head-on. In this example, both the distracted driver and the pothole played a role in causing the crash. While cases are fairly straightforward when people must be held responsible for their negligent actions, a case becomes significantly more complex when a pothole or some other defective road conditions played a role in the crash. Surprisingly, these kinds of cases are more common than you might think. In fact, in 2006, one study showed that nearly a third of all car accidents in the United States were related to poor road conditions, resulting in more than two million injuries and 22,000 fatalities. The estimated total cost of crashes caused, at least in part, by road conditions was $217.5 billion. So who is liable for dangerous roads, and can you be compensated if a road defect caused your crash and subsequent injury? First, it helps to have a basic understanding of how negligence, fault and insurance plays out in the Sunshine State. Florida is a no-fault insurance jurisdiction. In the event of collisions or accidents, a motorist must file for compensation with their insurance carrier. If a party sustains a permanent injury, then he or she may maintain a legal action for damages. Recovery for personal injury in Florida is a difficult process. The no-fault system is designed to keep cases away from the state’s courts and contained within the insurance system. Plaintiffs must pass a threshold and prove a permanent injury. Once past the permanent injury threshold, the plaintiff must prevail in a trial by jury. The jury must rule in favor of the plaintiff saying that the defendant was responsible. After determination of responsibility, a jury can still adjust the personal injury claim by the allocation of fault. The court or jury must determine if the plaintiff contributed to the collision. In every case, it is essential to determine the precise cause of the injuries. In the damages phase, Florida law applies comparative negligence. This system lets the judge or jury apportion fault between the parties when awarding damages to the injured person. If the judge or jury decides that there’s some fault on both sides, then they must adjust the award in proportion to fault. For example, if a jury determines that the injured party had ten percent of the responsibility for the injury, then it can reduce the recovery by ten percent. This system is intended to help solve legal issues that arise between two people or parties, but what if the cause of the accident was a condition or design of the road itself? Who’s responsible for those crashes? Florida drivers have the benefit of warm and sunny weather that inspires driving for both short and long distances to enjoy famous attractions throughout the state. Florida offers drivers the beauty of coastlines, pristine rivers, marshes, and other remarkable natural features. But there’s a dark side to the Sunshine State’s roadways. The abundance of traffic on streets, road, and highways lead to high rates of vehicle collisions. On top of that, bad weather conditions can cause reduced visibility and slick surfaces, and the constant heat and humidity can burden road maintenance. In Florida, road conditions are a common cause of single-car and multi-vehicle accidents and collisions. 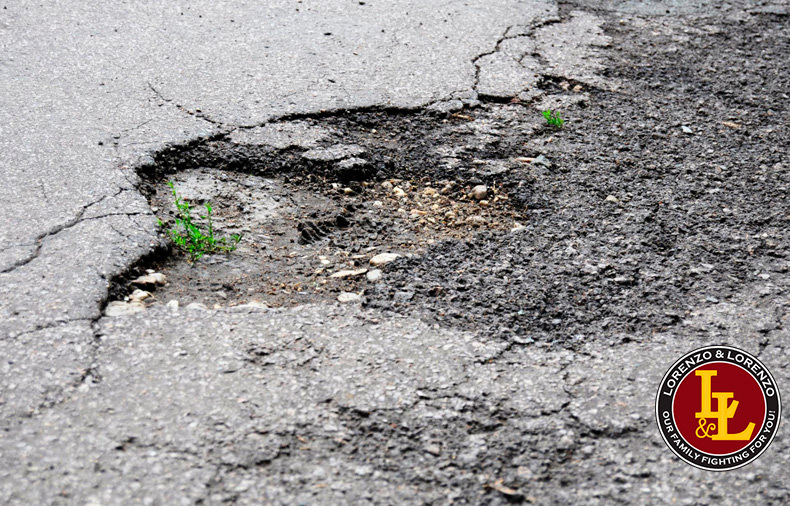 A defective road condition can result from poor drainage that builds dangerous levels of surface water, to potholes that ruin wheels and pop tires. Poorly designed roads are another distinct source of accidents and injuries. Poor road design can cause drivers to more easily lose of control of their vehicle. The defects can be in the design, construction, or driving rules that apply to the area. Roads can have tilts, slants, crowns, inadequate space, or be unsafe at the posted speed. So who’s responsible for these bad roads? The state of Florida has responsibility for road conditions. The state government is tasked with performing maintenance, inspections, and clean-ups to keep roads in safe operating condition. Where roadways have known faults or are under repairs, the state has a duty to warn motorists of hazards while it takes reasonable steps to solve the problems. The conditions that cause accidents can sometimes persist for years and cause many other accidents because authorities cite other causes such as excessive speed or driver inattention. Sometimes, the existence of defective road conditions emerges over a period of time. The repetition of similar incidents at a single location can put the government and the public on notice that there is a problem. Failing to solve an obvious problem can be construed as negligence. When road conditions cause damage to your vehicle or serious injury, you (the plaintiff) bear the burden of proving the conditions and that they caused or were part of the cause of the accident. The recovery for damage may be limited by your individual insurance policy. What’s more, the difficulty of proving that the government should be held responsibility may outweigh any advantage in a property damage case. If you or a loved is involved in such a vehicle collision, then you will benefit from expert legal assistance. Determining legal responsibility almost always requires a detailed assessment of all the facts and circumstances, especially considering Florida’s no-fault system. The actual causes of an accident may not be apparent on the face of the events. In complex accident cases, determination of the actual cause requires a professional examination and a thorough legal analysis. If you think you may have a claim, it’s important you act swiftly before your case expires. Under Florida’s statute of limitations, you only have three years from the date of the accident to initiate a car accident lawsuit against a government entity for poorly maintained roads (one less year than standard car accident cases). At Lorenzo & Lorenzo, we employ rigorous examination, measurement, and research to determine the factors that may have caused your collision. We have extensive experience and expertise on how to gather and analyze evidence. Contact us to schedule your free consultation.